So, I have been a bit more in a stitchy mood so far in May. I have been a bit busy, but I at least am starting to feel like I am making progress again. To start off the week, I pulled out my Bordeaux Sampler again. I really did make progress on it, even though it might not look like it. 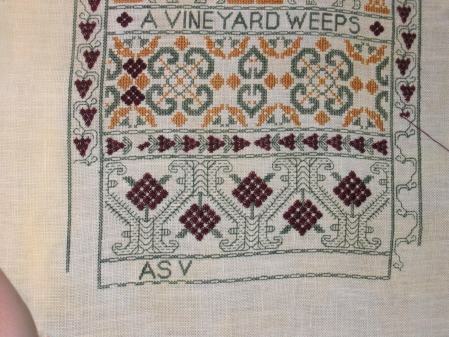 Tons of green backstitching and a multitude of Rhodes grapes. I also spent some time on Wednesday stitching on Stargazer. I didn’t make any visible progress on her this past week so I didn’t bother with a pic. I hope to make a bunch of progress this week as I really enjoyed working on her again. Here is my start on Lady Scarlet. 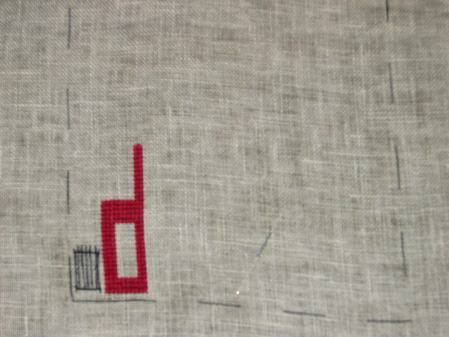 My RR is stitched on 40 ct Creme Brulee linen by R and R Reproductions. It is an absolutely stunning color. Your Bordeaux Sampler is looking gorgeous! Nice start on Lady Scarlet! I’m working on Lady Violet. It’s fun to stitch! Bordeaux is looking great, and a great start on your RR. Oh, the Bordeaux is looking beautiful! Congrats! Bordeaux is looking fabulous and I can’t wait to see your progress on Stargazer. Lady Scarlet looks beautiful – I just love those Lilybet “Ladies”. Bordeaux looks great – I can see your progress!!! Oh, I am so dreading basting my fabric too, but I know I have to do it quite soon!! Ugh!! Your start looks great – I love Lady Scarlet! Bordeaux is looking really great Leslie. Bordeaux is lovely, and it looks like a nice start on the RR. I love your fabric choice!